Following Uber’s big move into the trucking business with the recent purchase of Otto’s self-driving truck platform, word has it that Amazon is about to move in on the game as well. According to Business Insider, the shipping giant is developing its own “Uber for trucking” app that will cut out the middleman and connect truck drivers directly with cargo. Set to launch in the summer of 2017, the app will eliminate third party freight brokers and their pricey commissions, allowing Amazon to streamline the shipping process and broaden its horizons as a logistics company. The app also promises to benefit truck drivers as well. "The app will offer real-time pricing and driving directions, as well as personalized features, such as truck stop recommendations and a suggested "tour" of loads to pick up and drop off. It could also have tracking and payment options in order to speed up the entire shipping process," the Business Insider report reveals. After the big delivery debacle of Christmas 2013, when bad weather and bad logistical planning resulted in both UPS and FedEx failing to deliver Amazon’s goods to customers on time, Amazon has developed several strategies to control its own deliveries. In addition to purchasing its own fleet of trucks and using more distribution centers across the country to speed up the final-mile delivery process, the company has also turned to technology. Already it has been experimenting with drone deliveries and recently released its Amazon Flex app, which allows anyone to sign-up and make local Amazon deliveries using their own private vehicle. Amazon also announced earlier this year, that over the next few years it will be leasing 40 cargo planes to help increase shipping speeds as well. The “Uber for trucking” concept has already gained significant ground with start-up tech companies such as Seattle based, Convoy. Ironically, the company is headed by former Amazon employee, Dan Lewis and has raised more than $18 million from heavyweight investors including Amazon founder and CEO, Jeff Bezos. Convoy’s software matches companies needing to ship freight to trucking companies with empty vehicles. The shipper enters details of what needs to be moved and where, the software sets price for the job and truck drivers are alerted to accept the job. 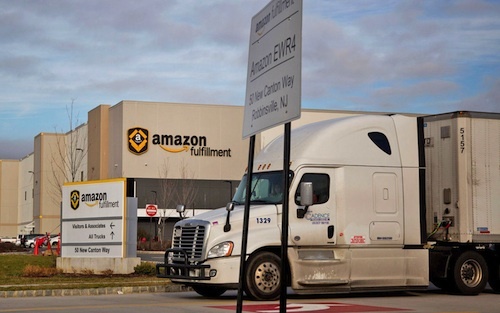 It’s still not known whether Amazon’s app will work similar to Convoy’s, or if it will be more geared towards independent truckers for long-haul deliveries. Either way, it looks like the e-commerce company will be moving in on the $800 billion trucking business. Amazon requirements and pay per mile are on two opposite side of the spectrum. It would seem if you eliminate broker, driver would be paid more but this is not the case with Amazon. We have over 80 trucks working out of Atlanta & Cincinnati their pay per mile is good but 18-24 hours between runs. Yes they are unorganized. They cancelled on me in Petersburg VA.
Amazon is a wreck they're dock worker's all take breaks at same time so it back logs truck traffic to offload. I have sat in line long hrs because of this and shortage of space for their inbound. Most unorganized company I've ever seen! Hated going to them Amazon WH. Hopefully they don't scalp like the brokers! Try to negotiate with broker they come back with load is gone! They have no choice, they have screwed all their major contract carriers hard. Their power will be their failure. Wow!!! Sounds like they need to invest in a Company Organizer that's Familiar with the Trucking Industry!!! Wish I was younger and in better Health,,I'd LOVE to take that Position!!!! GOD BLESS THE TRUCKERS!!!!! Sounds confusing to me, will it cost ppl their jobs.? Gotta look into it, no doubt. Oh the poor rag heads.